Arrival and our visit to the Gellert Thermal Spa bath in Budapest. Visit to Gellert thermal spa bath on the first day of our Cycling in Hungary holiday. Having left Luton at 6:40am we arrived at Hotel Walzer, Budapest at midday, having bought 4 single trip bus tickets (185 forints) at a kiosk at the airport since we planned to visit a thermal bath in the afternoon, before setting off in the cycling tour the next day. First we ate a packed lunch in our room and then went to sleep for an hour. It was a nice warm sunny afternoon and we grabbed our swim things and walked out of the hotel, turning left at the first road to follow a curving route upwards to the main road where you can get the bus into town. The bus stop is on the opposite side of the road - bus number 8. Further up to the right towards the entrance to the cemetery there is a general store, a fruit seller and stores selling both fresh and plastic flower arrangements. Anyway, on the bus you get your ticked stamped on entry. The bus goes downhill then across a large traffic junction area and uphill again before approaching the Danube. On the final downhill stretch the road curves to the right and you need to get out before the bus crosses the Elizabeth Bridge. Here you need to start walking south along the west bank of the Danube, below G�llert Hill, towards Liberty bridge which was build in 1899 and called Franz Joseph Bridge. It was destroyed by the Nazi's in 1945 before being rebuilt in its current form, retaining the decorative motifs of Turul birds and the royal coat of arms. The G�llert spa bath was our destination for the afternoon. The entrance is in the road opposite the Liberty bridge. It is rather impressive as you go in with a massive hall down the centre in front of you. We opted for the basic swimming plus locker ticket which gave us access to the large indoor swimming pool with its wonderful surrounding architecture and the indoor hot water pool at the end. Outside we could also go to the various sunbathing areas on the roof and around the large wave pool where the waves were switched on for 5 minutes every hour. There is a small eating area with snacks for sale. The most complex problem is finding the changing area where you get a small numbered disk corresponding to the locker you have used. 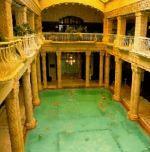 If you want the proper thermal baths make sure you ask. You then get directed to the relevant areas. They have various hot water baths with different temperatures and also turkish (steam) type rooms as well as hot dry sauna type rooms. Choose this option if you are going for the first time or if it is cold outside and you don't intend to sunbathe upstairs. There are many spa baths in Budapest and the one above we have been to before on a previous cycling from Vienna, Austria to Budapest, Hungary trip when we cycled from Vienna to Lake Balaton and ended up in Budapest for one night before returning home. 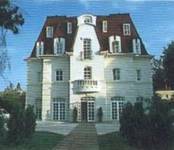 The spa bath at Sz�chenyi f�rdő has been recommended to us but we have not been there. To get back to the hotel we walked across the Liberty Bridge, sat down and had ice creams and then walled north amongst the street cafes till we came to the Elizabeth Bridge. There is a row of bus stops here on the left. The end one is for the No 8 bus. Don't panic regarding the bus route; once it starts off it does a quick circular tour of the block to the left before crossing the bridge via the in line access ramp road. Later we met up with the cycle tour guide and driver of the mini-bus with the cycle trailer, before supper.